Send your links and site update information to us for listing on this and other pages on Great Bridge Links. Listings are free! Use the ADD ME form at the bottom of every page. Spring 2019: Some new links for Club Owners & Managers. To see a page of links to softward, products and more view our Bridge Clubs Page. Spring 2019: TeachBridge.com – the new website for bridge teachers from Master Point Press. Newsletter, articles, books & resources. Sprint 2019: Playing Cards Wallet – PVC Vinyl wallet with pockets for decorative card inserts. Spring 2019: Ned Plays Bridge – Ned Paul made the trip from London, England, to check off an item long on his bucket list: attending an NABC. To chronicle his adventure, Paul is blogging at nedplaysbridge.co.uk. 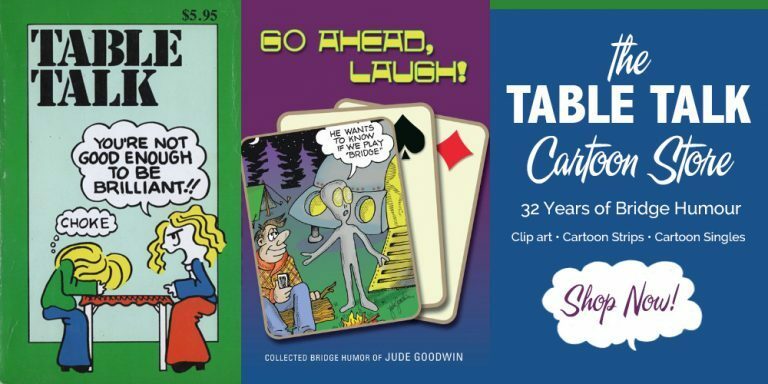 Spring 2019: The World of Playing Cards – love this site! The World of Playing Cards is a living encyclopaedia of the history and visual art of playing cards. Their mission is to make a contribution to the public awareness and appreciation of this fascinating and ancient subject that encompasses so much of social involvement, play, history and art. Spring 2019: Bridge Creations – not a new site but one we’ve just recently discovered. Enjoy bridge products and gift items from South Africa. New Year 2019: BridgeScanner™ – is advertised as an easy to use and powerful platform, to create and manage, promote and optimise Bridge events around the World. So far available in English, Polish and Russian. We had our journalist Alex Coyne connect with BridgeScanner and you can read his interview here. New Year 2019: Bridge Gear – this isn’t a new site but we hadn’t come across it before. With the byline of Welcome to book heaven, Paul Lavings presents an online used bridge book store. And it’s not just a store! There’s a wonderful museum, new books, club supplies and giftware as well. Australia. New Year 2019: Sociology of Bridge. PhD student Kevin Judge works to help keep bridge alive and attract more players to what we know as the best card game in the world. Winter 2018: Silicon Valley Youth Bridge. Inspiring the next generation of bridge players on the San Francisco peninsula and surrounding areas. Winter 2018: Begin Bridge (app) – Improve beginner bridge players’ skills and teach bridge in an entertaining, and an easy way. Winter 2018: LearnBridge – Learn to play Bridge with LearnBridge! Bridge is enjoyed by tens of millions of people around the world. Bridge is the ultimate trick-taking game, similar to Hearts, Spades, or Euchre, but with deeper and more rewarding strategy. Winter 2018: WizBridge+ – The new ‘Bridge’ game which will enthral and enthuse the complete novice, while pushing the Grand Master to the limits of their ability. WiZBridge+ is loosely based on Mini Bridge, which is an established teaching variant of Bridge. Winter 2018: Bridge Doodle – Whether you are just learning bridge or you want to perfect your game, the world’s only Bridge Doddle flash card system is your ideal companion. Answer the question on the front of the card, turn it over and compare your answer. Winter 2018: Bridge Magic – Bridgemagic is a unique and exclusive bridge site featuring hand histories, conventions and tips for bridge players of all levels. Fall 2018: NukkAI – Bridging the Gap. Building Next Generation AI : 𝝂Bridge. The game of bridge is the next milestone for AI : We are working hard on this fascinating challenge. Fall 2018: The 15th World Series of Bridge – Great Bridge Links Jump Page. Find links, news items, interesting articles and more. May 2018: Bridge in A Box™ by Patty Tucker. Contains playing cards, player workbooks, a table mat, a quick start option and access code for four people to a video tutorial and an app. Learn bridge at your convenience, the way you prefer to learn, and at your own pace in your home. Patty and her project can be found on Kickstarter and she hopes to release the product at the NABC in Atlanta. You can find Patty’s website here and her Kickstarter here. Spring 2018: Kida – Double Dummy app for Kids (and Adults) to learn card play. Level 1 is designed for an absolute beginner.Levels 5 and 6 will be suitable for the intermediate player. There are 52 puzzles in each of the 6 levels. Its a hand holding app – so starts very very slowly – BUT one can start at ANY level.3 puzzles are unlocked in each level, but when each get solved successfully, the next one gets unlocked, and so on. Click here to travel to their website and download. Spring 2018: Trump Suit Bridge – Bridge supplies and more from China. Trump Suit Bridge has a factory where they manufacture many of their products including bid boxes, cards, boards, bid trays and table screens. They also offer customized products for your tournament or club. Spring 2018: Adventures in Bridge. Learning and teaching site founded by Robert Todd, a professional bridge player and teacher from Tallahassee, Florida. Robert and the rest of the AiB team have worked hard to develop their individual and group teaching skills. This team approach to teaching and developing students has led to many innovative approaches to bridge teaching! The website features This Week in Bridge (TWIB) a series of bridge lessons currently at number 227. The archives are available as well. Winter 2018: Blue Starships – The Blue Starships mission is to to provide handy easy to use bridge applications for mobile devices. Currently they offer FREE Google Play Apps including Bridge Score Calculator, Bridge Bidding Box, and Bridge Diary. Winter 2018: www.clasesdebridge.com A lot of information and articles about bridge (in Spanish). From Roberto Vigil. Mahatma Gandhi practiced bridge for much of his life. He even used it to explain his beliefs. He said that kharma (predetermined destiny) is the hand that is received at the table. Dharma (action of man) is the way one plays it. We are not subject to any certain fate because we have the ability to play the hand, and we can do it right or wrong. Fall 2017: Bridge World Links Page – this isn’t a new page but newly discovered and a great resource. What you don’t find on GBL you may find on the Bridge World website. Summer 2017: Online Youth Bridge Magazine – the World Bridge Federation has launched this great new online bridge magazine for youth which features videos, stories, quizzes and more. Summer 2017: ProBridge – a national bridge agency whose goal is to connect bridge enthusiasts with the professionals. Whether you are looking for a bridge teacher or a professional partner ProBridge will create the most efficient relationship for you. Summer 2017 : Bridgetidningen.com – Bridge website and playing guide for online bridge and games. Spring/Summer 2017: B.I.L. Bridge – The Online Bridge Library for Beginner and Intermediate Bridge Players. Fall/Winter 2016 : Contract Bridge Lessons – A complete bridge course from Michael Furstner with 13 lessons for beginners and another 10+ covering intermediate and advanced. Lots of excellent material here! Fall/Winter 2016: The Card Caddy! The ONLY playing card case which converts to a discard tray so you can play any game of cards anywhere, anytime. Summer 2016: Info Bridge – Bridge for all the world. Based in Italy, this site promises Biographies, history, convention, deals, quiz and more. Summer 2016: Thinking of a Bridge Cruise? Friends of Bridge Cruises – Bridge is our game, but fun is our passion! New links in the world of bridge and cards. The posting date shows when the new link was added to this page. We leave the links here until they have been moved into other sections of Great Bridge Links. Do you have a bridge link that you can't find on our site? Send it to us using the form in our footer. All bridge-related links are free! as seen in the ACBL Bulletins. Here are some sites that take on the enormous task of on online bridge encyclopedia. Contract Bridge on Wikipedia Available in 16 languages. Wikipedia, the free encyclopedia that anyone can edit.